Picasso Is Coming To The Dali - St. Petersburg, FL. 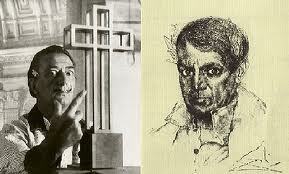 Picasso and Dali met in 1926, Dali was 23 years younger than Picasso and in his early twenties. Dali's works were influenced by Picasso's style at the time. They were not close but did remain friends; both had huge egos and were highly competitive. Picasso at the Dali will open November 8, 2014 till Feb. 16, 2015. This will be the only American exhibition. Then it will move on to the Museo Picasso in Barcelona, Spain. Both were born in Spain, although they spent most of their artistic lives in Paris. The exhibition will pair and compare works from both Picasso and Dali. You can read a comparative essay on both men here. The Dali Museum is located at 1 Dali Blvd, St. Petersburg, FL. (727) 823-3767. No word yet on ticket prices; but Hey, it's Picasso and Dali- worth it whatever it the price. Shhh, don't tell the Dali I said that. See you there.